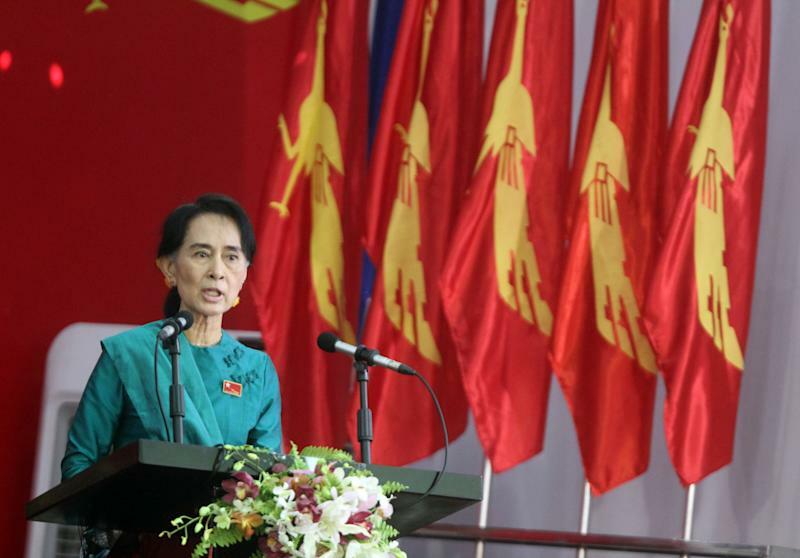 YANGON, Myanmar (AP) — It is a party dominated by a single strong leader. Top positions are made by appointment. Decision-making is quiet and circumscribed. That party is not Myanmar's ruling Union Solidarity and Development Party, which grew out of decades of military dictatorship. It is the National League for Democracy, led by democracy icon Aung San Suu Kyi and currently the country's best hope for building a viable political opposition after half a century of authoritarian rule. The NLD is holding an all-party congress to elect its own leadership for the first time in the group's 25-year history— an important step toward making it more reflective of its democratic ideals. 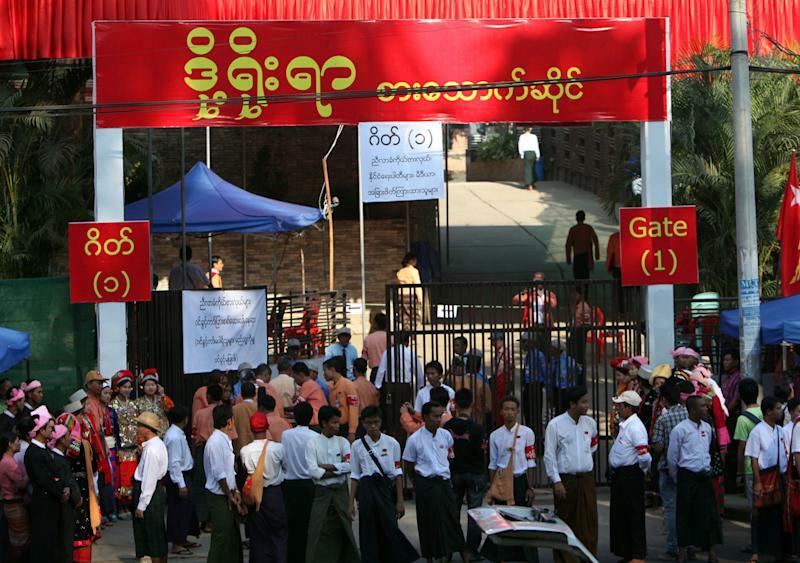 It is a sign of how far Myanmar has come with political reform that the gathering is allowed at all. But it's also a test for the NLD, which is working to transform itself from a party of one into a structurally viable political opposition in time for national elections in 2015. "Our party must be renewed and reformed," said Tin Oo, who is overseeing the organization of the congress. "We are going to advocate for democracy, so our party must be based on democratization." 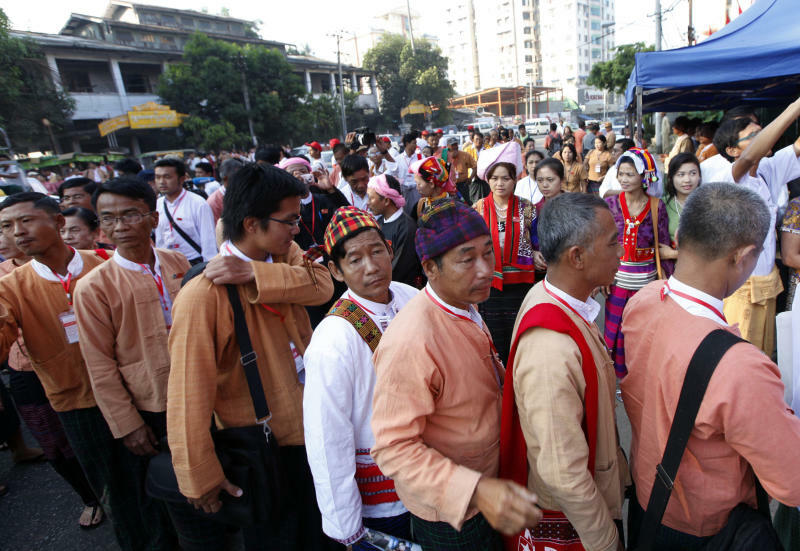 The renewal began Friday as nearly 900 NLD representatives from across the country gathered at a restaurant in Myanmar's main city, Yangon, where the three-day congress is being held. Above them, red NLD party flags, decorated with golden fighting peacocks, fluttered in the early light. The mood was ebullient. "I am very excited to be here," said Nan, a 46-year-old woman from a ruby-rich area of the northern Mandalay region who goes by one name. "We hope to see the NLD transform into a more democratic structure, in line with the changes taking place in the country." Forged under authoritarian rule, the NLD has been, in some ways, a mirror image of the country's ruling Union Solidarity and Development Party. Unable to convene party meetings, with its leaders often jailed and the party itself officially banned for much of its existence, the NLD could not hold elections. Leaders had to be appointed. Secret and summary decisions had to be made. And in the unforgiving narrative of repression that has long governed Myanmar, there were heroes who were not to be questioned any more than the villains they fought. Tin Oo is aware that he himself stands as evidence of the urgent need to groom a new generation of leaders for the party, whose top ranks include men who are quite literally toothless. An energetic 86-year-old, Tin Oo is one of three surviving founders of the party. But the effort to inject fresh blood and expertise and bring more ethnic minorities and women into leadership positions has also brought conflict. Some longstanding members of the NLD — many of whom made enormous sacrifices while less courageous souls stayed out of politics — now feel supplanted. "We try our best to balance the old and the new," Tin Oo said. "But there are quite a lot of quarrels." The NLD was founded in the wake of Myanmar's thwarted 1988 popular uprising, when students, monks and ordinary citizens swarmed the streets demanding political change. The country's military junta cracked down, killing several thousand and successfully stalling the momentum of revolution. It was then that Aung San Suu Kyi's political career — and the National League for Democracy — were born. Within two months of its founding, the NLD began planning a nationwide congress to elect leaders, but they were only able to hold a few township elections. "Then all of us were sent to jail and kept there for a long time," said Win Tin, 83, a journalist and NLD founder. One testament to the importance the party still places on this democratic exercise is the speed with which it has executed it. The very night Suu Kyi was released from house arrest in November 2010, NLD leaders met with her to discuss how to reinvigorate the party, Win Tin said. The NLD re-registered as a political party in January 2012, swept parliamentary by-elections in April, and by June had begun convening more than 17,000 elections to select local representatives and delegates for the all-party congress. The structure of democracy is one thing, its culture another. Most members of the NLD, like the people of Myanmar itself, understand the contours of democracy only through its absence. This lack of a developed political culture, some party members say, contributed to infighting and irregularities that marred some of the local elections. The years of repression and Suu Kyi's iconic stature — she is greeted by villagers with cries of "Long live mother!" — have also centralized decision-making, which critics say is bad for the broader project of democracy and could weaken the NLD's appeal. "All the party decisions are dependent on just Daw Aung San Suu Kyi," said Yan Myo Thein, a 43-year-old former student activist and political analyst, who is not a member of the NLD. "This is bad for the future of the country and the country's reforms. If the party goes on like this, the support of the people on NLD will waver." These days, the tables outside the NLD's Yangon headquarters are littered with the junk of celebrity. There are Suu Kyi mugs, key chains, postcards, posters, photos, pins, fans and even a few corporate day planners. All are for sale. Inside, the tight, two-story space is plastered with her image — ever beautiful and poised — and that of her father, Gen. Aung San, who is regarded as the founder of independent Myanmar. One could be forgiven for mistaking the place as a shrine, except for the general dishevelment and buzz of activity. As Suu Kyi sinks deeper into the scrum of real politics, however, the glow of idealism that has sustained her leadership is fading. She has been criticized by the international community for not taking a stronger stance against religious and ethnic violence in western Rakhine state and lambasted for allowing the NLD to accept donations from blacklisted "crony" businessmen. Her conciliatory embrace of Myanmar's erstwhile villains may be a sign of deeper compromises to come. "Now she's giving blessings to the army," Win Tin said. "The army is a very bad element in the country. They have done very bad things." Even Win Tin, who spent nearly 20 years as a political prisoner, recognizes the strategic importance of getting along with the military, which still dominates the country's institutional life. Myanmar's military maintained its own elite academies, even as the ruling generals debilitated the public education system, fearing waves of student revolt. Many ambitious young people saw the military as one of few paths to a secure future. Today, the military has the education, the expertise and 25 percent of the seats in parliament. Suu Kyi knows she, the daughter of the country's most famous general, must win their trust if she is to become president in 2015. This is not merely a matter of governance. Myanmar's constitution would have to be amended for Suu Kyi — the wife of a foreign national — to take office, and for that to happen, she needs the support of more than 75 percent of parliament. Tin Oo, an old military man himself, believes the NLD needs a strong leader to tackle their formidable opponents from the ruling party, men who come from the military and understand the power of hierarchy and loyalty. "To whom we are to encounter? The military men. That is why we must keep strong and surround her," he said, pounding his fist on the table. "We are going to create a strong party around her." He believes in Aung San Suu Kyi as an enduring idea that can sustain the party even in her absence. "We were never a personality cult," he said. "Even if she dies, the tradition and heritage remain." Phyu Phyu Thin, an HIV activist and an NLD parliamentarian, doesn't want to speculate on a future without Suu Kyi. "We pray for her good health," she said.